Intel’s Andy Grove: How Should a Manager Be Measured? At MindFire, we’re experimenting with using Objectives & Key Results (OKRs), which I wrote about here, to provide a clear set of objectives and key results to define “success.” OKRs have been used at many companies, including Intel during Andy Grove‘s tenure. 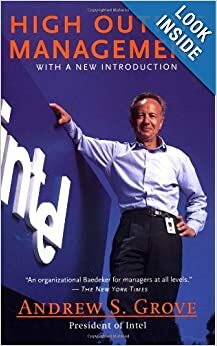 During the process of researching how OKRs were used at Intel, I re-read Andy Grove’s “High Output Management“ in the hopes of picking up other insights. I highly recommend the book, as it gives direct insight into the mind of Andy Grove (who by many measures, must have done something right). In the book, Andy looks at the role of a manager, and asks questions about how a manager should be measured. He argues that it is not the manager’s output which is the key result — rather, that the output of a manager is the result achieved by a group either under his supervision or under his influence. Managers are responsible for (and should be measured by) the output of their direct reports, and for the output of the people that report to their direct reports. In terms of output, how do you think a manager should be measured? Do you agree with Andy’s view?